about the new track, Something About You, and whether there is a story behind it. 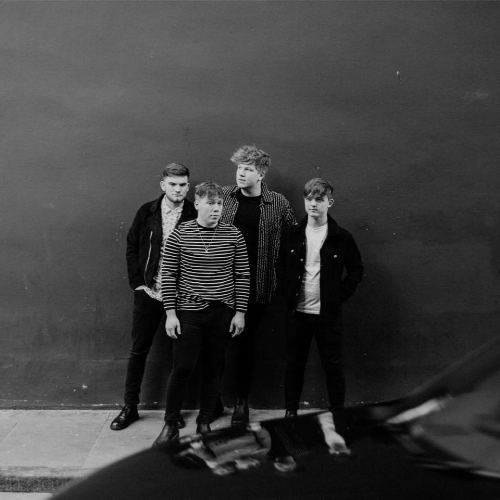 I ask the Edinburgh band how they all got together and what it feels like being featured on Made in Chelsea - they highlight some local artists that are worth getting behind. I was excited to know if they are touring and what happens next in terms of material; if they ever get time to unwind away from music; which albums are important to them – the guys each select a song to end the interview with. Hi, LaKyoto. How are you? How has your week been? Hi team! We’re great, thanks. It’s been a busy week so far with rehearsals, demoing and gig promotion - and it’s only Tuesday! We are LaKyoto, a four-piece Synth Pop/Alternative band from Edinburgh, Scotland. We pride ourselves on writing huge Pop songs with stomping drums, pounding sub-bass and soaring melodies. Something About You is new. Is there an inspiration/story behind the song? Something About You is a twisted love song about how love can blind us to the worst issues and cause us to fall into the same traps time and again just to feel wanted. So many of us stay with the wrong people simply because it’s easier, without thinking about what best for ourselves. This isn’t what love should be about and the lyrics of the song demonstrate this conflict and how we so often settle for less. Will there be more material coming later down the line? Can you remember when you got together and started making music? We first started making music together whilst studying music at college a couple of years ago. We had all been in various bands over the years, but this was the first moment where everything really clicked musically. We spent a lot of time in our first year writing music and practicing it together so that, when we eventually went live, everything was already in place. What is it like having your music backed by the likes of The Line of Best Fit and Made in Chelsea?! The support we’ve had from The Line of Best Fit and Made in Chelsea has been incredible. It’s very surreal hearing your music being played on one of the biggest shows on television - especially as an unsigned band - but we see it as a massive compliment. We really felt the benefit of featuring, with a number of new fans saying that they looked us up because of the show. We’d love to feature again and hopefully now that they’ve used our music once, they might use us again. Do you have shared music tastes? What was the sort of music you were raised on? Luckily, the four of us all have the exact same taste in music and all love the same bands as each other. We love music with bright, punchy synths and catchy, singalong melodies - and some of our favourite artists include Everything Everything, Nothing But Thieves; The Naked and Famous, Sigrid and The Killers. Our music tastes aren’t restricted to specific genres either, which is extremely important for the songwriting process: it allows us to draw influences from absolutely anywhere and we feel that if it’s a good song, it’s a good song. We even referenced Kylie Minogue recently to help us write a song. It was definitely strange. But definitely worth it. Our brand new single, Something About You, will be released on 28th September and we’ll be celebrating this at our Edinburgh headline show on 5th October at The Mash House. We have a few more special treats for our fans to come before the end of the year as well and, come January, we’ll be ready to start all over again with some brand-new material and more releases coming very soon. Playing at Belladrum Tartan Heart Festival this summer was probably the big stand out for us in our time as a band. It was amazing to play at a festival we’ve all attended over the years; made even more special by a much bigger crowd than we could have expected. Special mention for featuring on Made in Chelsea as well - a year later and we’re still trying to process it! Everything Everything are our shared favourite band and their most recent release, A Fever Dream, has helped shape the band into what it is today. Every single song on the album is beautifully-crafted and the ingenuity and attention that has been paid to every last detail has greatly influenced our own sound and mindset. We have drawn a number of influences and ideas from listening to this album and we still listen to it every single day. If we could support any one act today, it would be Everything Everything. They are one of the main reasons this band exists and it would be an absolute pleasure to share a stage with them. We’re not picky with riders: as long as there’s an unhealthy amount of Irn Bru and Haribo, you’ll get no complaints from us. We’re playing our biggest hometown headline show to date on 5th October at The Mash House, Edinburgh. We have a couple more shows in the planning stages before the end of the year; then we can start fresh next year. Touring would be a very important moment in the development of the band and it’s definitely something we’re looking at. The best advice we can give to new artists would be to just enjoy it. Write the music you want to listen to and don’t write it for anyone else. If you believe in your music and you have a passion for what you’re doing then other people will too. Being in a band is a much more difficult job than anyone outside of the circle can understand, but the second you’re not enjoying it, take a step back and start again. And make mistakes! It’s the only way new bands can really learn, and once you’ve gone through that process, you’ll really start to see the benefits. That’s when you know you’re on to something. You have to make big sacrifices - and you’ll forget what sleep is - but watching your band grow is worth it in the end. There’s a lot of incredible talent here in Scotland - and the national scene is only getting stronger. We’re really into Retro Video Club and Vistas at the moment - both from Edinburgh - and we can’t wait to share the stage with Lost in Vancouver, who will be supporting us at our next show. Not really! But, it’s definitely something we’re getting better at. At this stage of a band’s existence, you almost have to commit your entire life to the cause; to start climbing up the ladder and expanding your fan base. No one else is going to do the work for us, but we’re extremely driven and have such a genuine passion for making music. Most importantly, we enjoy what we d so it’s never a chore to us anyway. Netflix breaks definitely help.